Beautiful, updated 2 bedrooms, 2 full bathrooms, stilted home on canal with direct ocean access. You can be out fishing in the Atlantic in no time! This warm and comfortable single family home has an open concept living room and kitchen/dining area. The living room has French doors that lead out to the balcony that has a covered area with seating and ocean views. Relax and enjoy the breeze on this great outdoor deck with a view! The master bedroom has a queen bed & TV. The guest bedroom also has a queen bed & TV. TV in living room. There is a sleeper sofa located in the living room. Well equipped kitchen. Dishwasher, microwave, central air conditioning. (no heat). All linens provided. Washer and dryer are in separate laundry room. Spacious outdoor downstairs area with picnic table and garden space with seating. Boat dockage included. 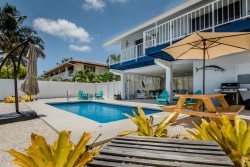 Centrally located in Marathon and convenient to nearby restaurants, grocery, attractions, post office, and Sombrero Beach. Key West is a scenic drive about 50 miles away. Maximum occupancy 4. Discount for multiple month rental.